I don't know why, but that made me laugh really hard, lol. Nope it only works on making flints ones that I know of right now. There is a recipe for flint though if that helps. It also works on Jasper. Incidentally, does anyone know of any non-essence way of spawning mobs in the pack? I'm worried about having enough essence (I know the resourceful furnace produces some) given that in Minefactory Reloaded I always needed some sort of essence generating spawning mechanism to keep up with the essence demands of an Auto-Spawner. 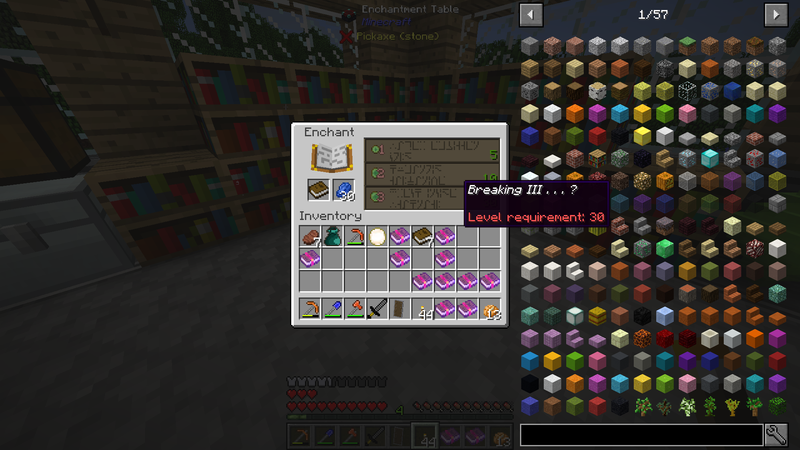 Anyone know what what the "Breaking" enchantment does? Any variation of words and googling just gives me results of people in 2011 whining about how the new enchanting feature of the time was "breaking" minecraft. I cannot figure out what it does and it comes up about 50% of the time while using the enchanting table. What are y'all doing for flight? Traversing the end is terrible. I'm using a Chaos Gem with Flight, Capacity 4 and Recharge 4, which works wonderfully, lasts a long time and recharges pretty fast. Hopefully I'll eventually find an Everlasting Abilities totem with Flight, though, because it would be nice not to have to ever worry about running out of power. Incidentally, I'm surprised that the Youtuber's I've watched play haven't been using Industrial Foregoing's Resourceful Furnace. It smelts 3 things at once, is reasonably fast (it takes 39 ticks to smelt 3 items when upgraded) and produces Essence. I've been making Fluxed Phyto-Gro, and my automation for that has produced something like 100 buckets of Essence in just a couple of hours. Seems like a nice additional source for Mob Spawning. I'm also tempted to make a second ET Void Ore Miner. It's taking forever to get the stuff I need to upgrade to a tier 2, and since I want to have 1 of each miner, the only real waste would be the controller block. Edit: Word of warning to anyone making the Angel of Vengeance statue thing. It will delete everything in an 11 X 11 area centered on the middle of the structure (don't know how tall). It deleted my elevator and part of my phyto-gro set up when I made it...also, it sets you on fire with lighting. Sigh. They haven't figured out the Plastic generation. Plus they stick with what they know most times until someone suggest it in the comments. So, the mob crusher goes through all three stages on slimes, but sadly it's doesn't appear to be essence positive. Still not sure how to keep up with essence other than constantly smelting stuff that just gets deleted. That disappointment aside, XNET is freaking amazing. It's like EnderIO conduits you can program. 1 wire connected to my Mob Duplicator and Mob Crusher is moving all the power, fluid and items around, as well as the redstone signals, and it's putting all the junk items (which is pretty much just stone swords from Wither Skeletons) in a nullifier. Also...what are people doing food-wise? I'm not exactly short on food, but it seems like my saturation/food goes down ridiculously fast. I've been eating food with 6 1/2 bars of saturation, and it still feels like I'm eating constantly. I'm kind of hoping for a Saturation Everlasting Ability Totem at this point. Specialized Redstone Furnace! Then use the raw meat stew recipe in the furnace. The pink slime seems to be essence positive, not too mention the amount of totems you get from them. As for food, I was using the Calculator mod hunger and health modules with the respective trees you need. But now I've found a saturation totem, so I'm good. But if I needed, my beginning essence farm from using cows produced so much steak...But I am also using the Resourceful Furnace and just smelting cobblestone into stone and those go into a Black Hole Unit in order fill tanks of essence easier. Woo...it's been 3-4 days now, but I finally have enough Erodium to upgrade my void ore miner to tier 2! Edit: Could somebody do me a favor and let me know what the chances of getting Kyronite from a Tier 2 Void Ore Miner is for you? I'm curious how much I'm screwing myself by having added the Silent's Gems stuff to the Void Ore Miner. Doesn't seem like something you'd get an answer to. I still don't know what the breaking enchantment does. if I remember right and it still works like the old versions. The breaking enchant prevents a tools from being destroyed when at Zero durability. Never mind it make your tools lose more durability then normal. FYI. Should be called "Curse of Breaking" then. Thats not a good thing to have. it is more for map makers so they can give like op tools but only for short time. I can't find any information on this anywhere so I thought I would ask here. Are Stone Circles for Roots busted in this pack? None of my worlds will show the "Moon Beams" that highlight the planting spots in Stone Circles to create the Roots plants and Rune Stones needed to progress in that Mod. On the Roots Issues Tracker there's general discussion of this occurring due to the entities that create the Moon Beams being erased from working circles, but nothing about never working at all. Given, there are so many cool mods with tons of content to progress down so I don't mind writing a mod off, but it bugs me having all these Roots world gen features spawning that currently are useless in my worlds. The markings for planting spots can be seen better under water. Look very closely for strange circular marks inside the area of the roots stone circles. Once all the items are in place, the moon beams activate and start pouring magic into the central mark. GamerwithnoGame and Mr_Hosed like this. OMG, you're right, pour some water around and there they are. Thank you so much!